We are UGOOS team. This thread about official firmwareâ€™s for UT3/UT3S/UM3. This thread will be update every time as new versions will be released. We are ready to actively cooperate with users and would be grateful if you will help us make the current firmware little better. 3. For mechanisms of initialization wifi and bluetooth was created special packages (wifi-ugoos and bluetooth-ugoos). In future it allow updating logic work of mechanisms without reflashing devices. 4. Added support 802.1Q in kernel. 5. Changed logic of work getting mac address for wifi. Now used unique mac address from module. 1. Linux: Temporarily disabled support of 4k resolution in linux kernel. Maximal resolution 1920x1080. For reboot from Android in Linux use button "Switch system". You can find this button in the power menu. 3. For mechanisms of  initialization wifi and bluetooth  was created special packages (wifi-ugoos and bluetooth-ugoos). In future it  allow updating  logic  work  of mechanisms without reflashing devices. 2. 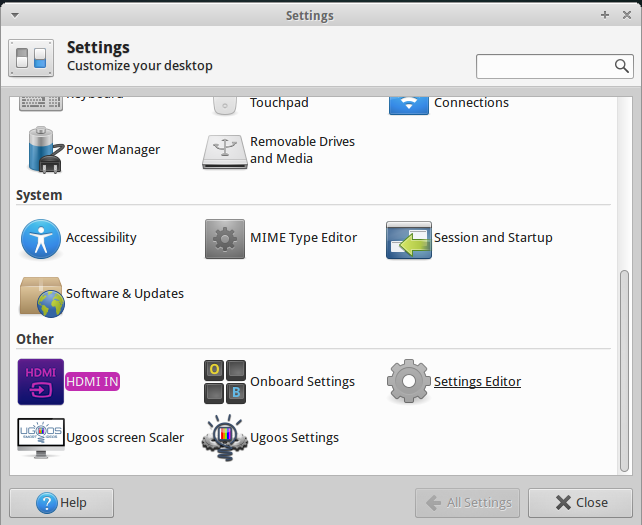 Linux:  Add applications: nano,  gnome-system-monitor, and screen keyboard - onboard. 3. Linux:  Add support of NFS in kernel. 4. Linux:  In kernel was include binfmt_misc module. 5. Linux:  Update kernel space GPU Driver (TX011-SW-99002-r5p1-00rel0). 6. Linux:  In system was included user space GPU driver for fb . To check the libraries we used examples from official Mali OpenCL SDK        and Mali OpenGL ES SDK for Linux (http://malideveloper.arm.com/develop-for-mali/). Known issues in v.0.3: 1. 1. Linux: Bluetooth became available for use in Ubuntu. 2. Linux: Changed deafault color color depth  to 32bit. 5. Linux: Was been enabled autologin. Now by default system not asked user password at system loading. 7. Dualboot: Now for users dulaboot system became available android update by OTA. In older version firmware for upgrading Android to new version         was need reflash device. 8. Linux: Now users of dulaboot system can make factory reset from the menu setting andoid. In older version if  you clicked on button "Factory reset" then  the device will be rebooted in Ubuntu. 1. Linux: Fixed bug with automatically updating dns server address when connecting to the network. 2. Linux: Fixed bug with buttons "Reboot" and "Shutdown". For UT-3, clickingthe button "Shutodwn"         causes the shutdown of the device. For UM-3, it causes reboot of the device, becouse UM-3  not have  hardware power button. 3. Linux: System automatically connect to the last wi-fi access point  after device booting. Known issues in v.0.2.1: 1. 2. AbiWord and Gnumeric will be changed on LibreOffice. 3. Web-browser was changed on Chromium with PepperFlash plugin, and now you can see flash content on web-pages. 4. Changed application for screen scaling in linux. 5. Hidden Android system partitions from Ubuntu. 1. Fixed bug with broking Bluetooth in Android. 2. Fixed bug with HDMI IN in Android on UT-3. 3. Fixed bug with error message in the gMusicbrowser when song switch on the next. Known issues in v.0.2: 1.
linux: Does not automatically update dns server address when connecting to the network. 1. Bluetooth is not enable switch on Android. 2. Screen scaling parameters reset to default after resting device. 1. In the Linux when you logout or you device switches to sleep mode you monitor does not resume from sleep. 1. Download firmware and unzip it use 7z, winrar, winzip. Inside: Android Tool - tool for reflashing, DriverAssitant - tool to install drivers and firmware image file. 3. After installing the drivers will run the Android Tool and click on the Upgrade Firmware. Click on Firmware and specify the path to the firmware file. You need waiting until the program downloading information about the firmware, then it will display some information on the screen. b) Connect the device to computer via USB cable, the device should use the OTG port. c) Hold down the hardware reset button. a) To turn off the device. b) To connect the device to computer via USB cable, the device should use the OTG port. d) Turn on the power. 5. Click the Upgrade button to the firmware of the device. At the end you will see a sign indicating a successful operation. In archive with firmware you can find full guide with images. Great thanks to peba, no_spam_for_me, RISCy Dude and bragma for help in creating and testing of firmware. Thanks to linuxium, and naobsd for the help with creating firmware for sd card. Last edited by Ava; 11-23-2015, 21:20.
i am nearly ready but i saw that another user already uploaded the translated HPH 1.7 Files in the Ugoos RK3368 Section. Now i go sleep my eyes are heavy. I changed some of the DE translations, so will build a new HPH RK3288 firmware. Then you can just check some of the menu translations. All the translations are over 500, but only a few are shown in the menus, so it takes too much time translating everything even if it is not shown. I already loaded your HPH 1.7 Files and started but some things only can be translated with Screenshots. Maybe 95% are okay without.I think to Friday the Files are ready. Yes i can test it but at the Moment i have to do other Things.Maybe next Week or so ??? I forgot i use a Huawei 3G Router and it works good with the other Devices. I also send you a message about translations, if you can check the DE translations I can use it in the next firmware. I added all the missing translations that only showed in English to the German translations. It is online translated so there might be lots of things that can be improved. I will use the checked translations in the next firmware. You can check it next week. once more , i really dont thing that the "AP6210 Bug" is normal.So why KK say that it is a "AP6335" chip. Somewhere there must be the reason why my Audio & Video stutters when Wifi is turned on. So i never will be able to use a LP or MM Rom on my UT3. !!!!!! You can also test my firmware, should work on your device. I added 2 fixes for stuttering audio playback, maybe it will also help for your problems or maybe have no effect. It is 2 files you flash. Please check if you still have the wifi bug on my firmware here. You also have a strange router, does it connect with 4G and wifi? Can you get a new firmware update for it or none available? I think it will be difficult for someone in China to do tests as the router won't be available there. Some 3G/4G & TP-Link routers with certain firmware I know have disconnecting problems with Android tv boxes. Only way is to replace the router with a different brand sometimes. Do you use bluetooth speakers, can you also test with tv speakers with a HDMI connection and see if you have audio stutters? In my firmware if playing 23.976fps videos, you can enable 'sync playback to display' in NTMC Kodi to not have video stutters. Here a user also reports stuttering audio, but he is using a USB DAC and a connected screen. You can maybe also look at the system usage when the music stutters. Start playing the music in the background then do the following steps while the music is playing and stuttering. 1.For the memory usage type "dumpsys meminfo" in terminal app from Google Play Store. 2.For the CPU usage type "top" command in a terminal app. to put no scanning files in all you audio/video folders, so Android doesn't scan all your files in the background that might cause slowdowns. again and turns off (alone) after a while. Thanks for the link but i mean the Gamepadsettings inside Settings. I dont use Netflix and others. do you mean that you have Stutters in Audio & Video when Wifi is turned ON ??? Off i have no Stutters / please can you look if Catlog says that the Wifi Chip is AP6210 or AP6335. My WIFI always makes new Searches and it turns off self / even on Wassers latest MM. I really hope that Ugoos will make it better in futured Roms.I am really disappointed about that. because my Box can handle LP. For the stutters with wifi on. Can you post new catlogs and dmesges with wifi on then restart and with wifi off with the new firmware? Try to also get a catlog and dmesg for streaming Netflix for a while if you can or if someone else can do it, please do. Does Netflix audio play in sync or is it slightly out of sync? Wifi On and off for me too. Same error at catlog with memtrack. Can you tell a bit more about this error 'catlog with memtrack'? memtrack usually means a driver wasn't loaded, but most probably it wasn't needed anyway. For the AP6212 wifi, it is just a text string typo, the correct AP63365 driver is indeed loaded. If there are wifi problems on other ROMs also, then please check your router settings and reset to default and also test with a different router. Some TP-Link routers have lots of problems with Android. Also set DHCP timeout in your router to a high value, 5-10 hours, sometimes it is only set to 1 hour in some routers then wifi disconnects after 1 hour. Using a static IP address or limiting the IP addresses you're Android device gets assigned also helps with connectivity problems. If everything was tried and there are still problems, maybe Ugoos can make some tweaked settings for users to test? i flashed 3.0.7 to test it.The System runs not bad but still stutters a little bit. The Stutters in Audio & Video (with activated WIFI) are still present !!! Catlog still shows AP6210 and some other WIFI Bugs,but i have a AP6335 and please dont say again it is normal. KitKat says it is AP6335 / Lollipop says AP6210 / this can not be normal.Wifi On Stutters / Wifi Off no Stutters. The German Translations i made are only added 50% / some Words are not right / Pop Up Menu's not translated. Bugs still exist / like BassBoostBug (Equalizer) or Sound on Touch !!! since 2 Years. Catlog / Memtrack Module Bug still exist !!! Later i will add some Catlog Files so you can see it with your own Eyes. All times are GMT-8. This page was generated at 02:11.